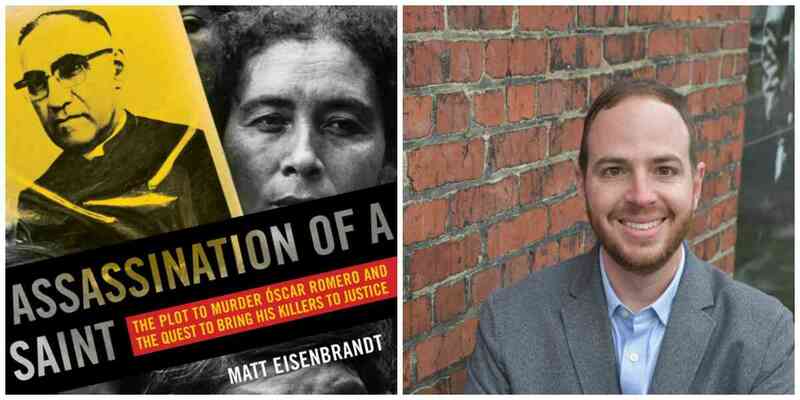 Matt Eisenbrandt - "Assassination of a Saint"
Matt Eisenbrandt discusses Assassination of a Saint: The Plot to Murder Óscar Romero and the Quest to Bring His Killers to Justice. About the book: Óscar Romero was known as the voice of the voiceless. During a time of great repression and violence in El Salvador, from 1977 to 1980, he was the Catholic archbishop of the nation’s capital and a leading figure in Central America. Romero gained admiration throughout the world because he had the courage to speak out in favor of the millions of Salvadorans without money or power who suffered terribly at the hands of the autocratic military. In specific and strident terms, he denounced Salvadoran soldiers for torturing and killing innocent civilians, and he criticized the economic elites – known as the oligarchs – for underwriting the violence. For that, Romero was murdered on March 24, 1980, while saying mass in a chapel on the grounds of a hospital for cancer patients. The shooting of Archbishop Romero made headlines around the globe and helped spark a twelve-year civil war in El Salvador that left over 75,000 people dead. Although a single gunman fired the fatal bullet, the plot to assassinate Romero sprang from a death squad network of military leaders, wealthy businesspeople and former soldiers. The U.S. government had played an important role in the development of these paramilitary forces in El Salvador, and several Salvadorans implicated in the death squads lived in or traveled to the United States. Some developed relationships with influential figures in Washington. Starting in 2002, as a young attorney with the Center for Justice & Accountability (CJA), I had the honor to investigate Romero’s murder and participate in a lawsuit against one of the killers, Álvaro Saravia. CJA became involved in the case because Saravia was living freely in California, and a key part of the organization’s mission is to take legal action against human rights violators found in the United States. During the case, my colleagues and I, working with Salvadoran partners, met with members of the group that murdered Romero, spoke to witnesses about the funding of the death squads, and eventually won a $10 million verdict against Saravia. My new book, Assassination of a Saint, tells the story of our investigation and lawsuit and explains the complex historical context that led a group of men in a heavily Catholic country to murder the most prominent figure in the Catholic Church. This will be an important year for Romero’s legacy. After decades of inaction, the Vatican has now declared Romero a martyr, and Pope Francis appears set to canonize Romero as a saint in 2017. The Salvadoran Supreme Court has also invalidated a long-standing amnesty law, opening the possibility that conspirators still living in El Salvador could one day face accountability there. While the authorities have yet to pursue a prosecution, and the country continues to suffer widespread violence and corruption, the historic developments in San Salvador and Rome provide a measure of hope for the future and reinforce Romero’s enduring message of peace and justice. About the author: Matt Eisenbrandt is a human-rights attorney who has devoted his career to finding legal means to prosecute war crimes. In the early 2000s, he served as the Center for Justice and Accountability's Legal Director and a member of the trial team against one of Óscar Romero's killers. He is an expert in the field of U.S. human-rights litigation and now works for the Canadian Centre for International Justice.